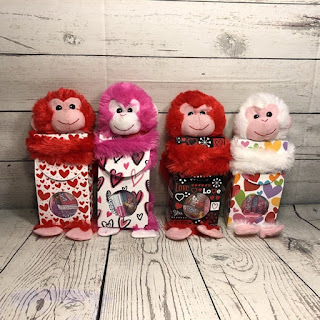 Love these Personalized Monkey &amp; Valentine Candy Box for $10.99 (Retail $16.99). These 12 in. hanging monkeys are the perfect Valentine's gift for any toddler or child! We offer red, white and pink monkeys. All are super soft and fuzzy, with a bowtie around their necks. The Valentine plushes have velcro on their hands so they can hang on to almost anything! The name is heat pressed so the name will not peel off. We use white on the red and pink monkeys, and pink on the white monkeys. They will be wrapped around your choice of a valentine box with 4 oz. of candy (laffy taffy, skittles, sweet tarts, jolly ranchers and nerds). All will come wrapped in a cello bag with a red foil gift tag. $3.99 for the first item and $1.99 for each additional item. US only. Ships no later than Sat, Feb 3.